Fancy: Beside The Seaside [D6230] - $8.00 : Yarn Tree, Your wholesale source for cross stitch supplies. 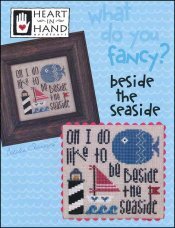 Cross stitch pattern from Heart In Hand. The verse "Oh I do like to be beside the seaside" accented with a lighthouse, sailboat, blue waves, and a large fish. Stitch count Fancy:Beside The Seaside (easel) 63w x 59h and Fancy:Beside The Seaside (framed) 63w x 59h. White Lugana 28ct Short Cut 9" x 55"
White Lugana 28ct Short Cut 10" x 55"
White Lugana 28ct Short Cut 9.5" x 55"